When it comes to the future of Greenland's economy, many Greenlanders hold very different views than their Danish counterparts. The latest and strangely under-reported poll about independence in Greenland is the most crucial, tell-tale piece of information about Greenland’s potential future in a very long time. It will tell you more than scores of ordinary news items. The results are gradually being more widely published; a series of key findings were delivered at a seminar just before Christmas at Ilisimatusarfik, the University of Greenland in Nuuk (you can watch the entire proceeding on YouTube). I talked to one of the authors and one of the Greenlandic research assistants on Skype that same evening; a fuller report is expected in February. I will get to the point in a second, but allow me a few pointers as to why all this is so important — including to readers who do not live in Greenland or in Denmark (to which Greenland is still firmly attached at present). First, Greenland is the world’s largest island — huge is an understatement. Strategically located atop of the North American continent, it serves as a sort of landmass buffer between North America and nations on the other side of the Arctic Ocean, many of whom the U.S. tends to consider its most potent potential adversaries: Russia, North Korea and China. This is why the Thule Air Base in the very north of Greenland is still so important to U.S. defense and missile defense in particular. The impressively tall and wide radar at Thule Air Base on top of a towering mountainside some 15 miles from the main base is designed particularly to detect any missile fired two the U.S. mainland from across the Arctic Ocean. This radar is manned and fully operational 24 hours a day, year-round. The gravel road from the base to the radar is kept free of snow at all times — no small feat at a location like that; a fire crew is on constant alert, a medical team always on premise and so forth. Last September during a visit to the base, U.S. Under Secretary of Defense for Policy John Rood took everyone by surprise when he issued a so-called “statement of intent” outling sweeping but vague U.S. plans for further investments in airport facilities in Greenland with a view “to the changing security environment in the Arctic.” To some observers this was an indication that the U.S. defense is increasingly worried about the boom in Russian military activity in the Arctic, to others it even spelled more U.S. ground troops in Greenland since more visiting military aircraft would of course need ground support. Rood provided no detail, but clarified how Greenland to is rapidly becoming still more relevant to U.S. defense forces for regional and homeland security. Second, Greenland is of course a crucial actor in its own right in Arctic affairs and an inspiration to many — especially neighboring Nunavut in Canada, which also grapples with issues of self-determination. Greenland provides input to discussion at the Arctic Council, participates in the Council’s scientific working groups, the International Whaling Commission, the Inuit Circumpolar Council and so forth. Naalakkersuisut, the Self Rule Government in Nuuk, recently announced its desire to soon open a representative office in China — on top of a brand new office in Reykjavik, Iceland. I could go on but let me mention just how Greenland’s more mythical image as the home of vast swathes of unrivalled and still heavenly wild Arctic nature and wildlife remains part of an image of Planet Earth that millions of people around the globe cherish and find comfort in. As climate change alters our perception of our potential futures, radical changes to such images may impact global reactions to climate change. Just last year, a report from AMAP, the Arctic Monitoring and Assessment Programme of the Arctic Council confirmed that 70 percent of the Arctic’s contribution to rising sea levels comes from Greenland, indicating again how important the islands is to us all. Hundreds of scientists go to Greenland every year to study this turbulence and make us wiser. Now, back to that striking new poll. The poll shows how 67.7 percent of all adult Greenlanders support the vision of Greenland as an independent state some time in the future. 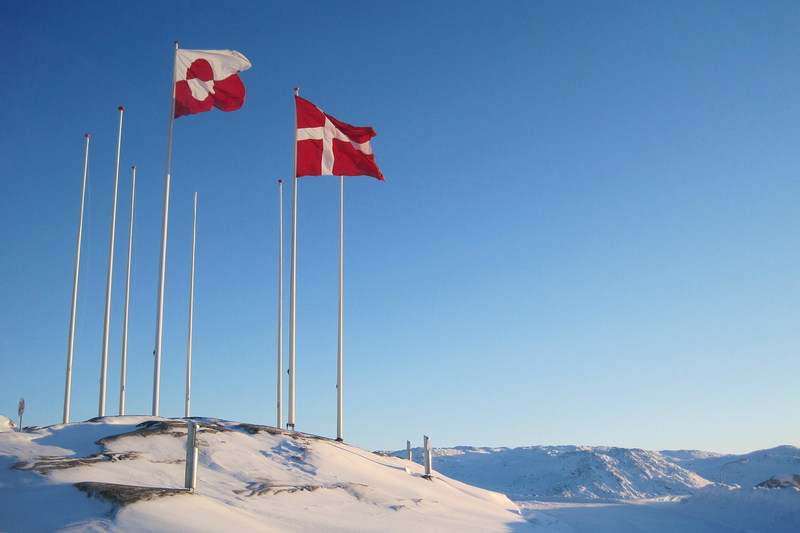 They wish for a Greenland that is no longer part of the Danish Kingdom — to which it was tied for some 300 years as a colony and, from 1953, integrated into as part of the realm. A portion of the respondents declared that they would support independence in just 10 years’ time; statistically however most pointed towards the year 2034 as most suitable for such radical change. The fact that such a large part of the populace supports the vision of independence is perhaps not so surprising. Two other polls, done by telephone by a small professional polling agency in Nuuk, have indicated the same depth of persuasion in recent years. The really groundbreaking piece of news is that 43.5 percent of the 67.7 percent who support the vision of independence also believe that secession from Denmark will have “positive” or even “very positive” effects on Greenland’s economy. Statistically, that translates into 32.4 percent of the total electorate. Among the 38.4 percent who say they would vote yes to independence, even if it was to happen already tomorrow, a whooping 62.3 percent expect independence to bring also a better economy. I am simplifying of course, but this remains the basic bottom line through most discussion of the issue in Denmark. Danish Prime Minister Lars Løkke Rasmussen and other politicians with him have often repeated, also in Parliament, that separation from Denmark would see a gradual end of Danish subsidies to Greenland, which would, in this world view, devastate the ability of Greenland’s Self Rule authorities in Nuuk to uphold the standards of schools, hospitals, roads, nursing homes, day-care centres, power supply and other vital civil structures. The annual direct financial inputs from Copenhagen to Greenland in 2018 covered some 52 percent of all public expenditure in Greenland. To many in Denmark the key question remains how on Earth people in Greenland can even start contemplating a severance of the existing ties as long as the have no way of replacing the subsidies? The recent poll now provides a partial explanation. The very point here is that many of those in Greenland who wish for independence subscribe to a completely different interpretation of the economic reality in Greenland than that which dominates discourse in Denmark. It is not that proponents of independence in Greenland wish for independence in some paradoxical defiance of the economic logic such as it is presented in Denmark. No, they just simply subscribe to a different logic. Which of course tells us a lot about why dialogue about the future is sometimes so painfully difficult and how crucial a deeper understanding of all relevant views will remain for the foreseeable future. What do the poll numbers really mean? The poll does not, unfortunately, provide much insight as to how exactly the pro-independence respondents in Greenland expect a severance of the present ties to Denmark to provide economic benefits to Greenland. But I will offer a guess that the same people who believe that independence would be good for the economy also believe that the present arrangement, where Greenland is an integrated part of Denmark, is actually already a hindrance for Greenland’s economic development. Again. I am simplifying, and there is much more to such arguments, but I have often heard claims such as this in Greenland. The premise for such sentiment has not been documented, there are no firm figures or solid research to support it, but the new poll indicates just how strong it is in public opinion. I should stress of course that there is still a sizeable proportion of the voters in Greenland, who do not support the idea of secession, not even in the long run, and that these people do not expect anything good for the economy should secession happen — they expect the opposite. But the poll goes a long way to explain why political parties who support the vision of independence at some point in the future till control all but one seat in Inatsisartut, the Greenlandic parliament in Nuuk. And, as mentioned, it indicates why the discussions between Denmark and Greenland about the long-term future can sometimes be quite cumbersome. I look forward to February. There is apparently more to come from the poll, including about how people in Greenland experience climate change. Watch this space! The poll referenced here was conducted in the summer of 2018. A team of researchers and research assistants from the University of Copenhagen and Ilisimatusarfik met face to face with 606 respondents in 13 different locations in Greenland — north, south, east and west — and asked them to fill in a questionnaire. The respondents were selected with the help of Greenland Statistics and represented a statistically precise subsection of men and women, young and old, city-dwellers and people from more remote settlements. All research was conducted as part of the project Greenland Perspective which brings together the two universities in a string of research exercises. Martin Breum is Danish journalist focusing on Arctic issues. CORRECTION: An earlier version of this article misstated the number of respondents among independence supporters who believed that Greenland’s independence from Denmark would bring positive economic effects. Of the 67.7 percent who support independence, 43.5 percent expect economic benefits, not 62.7 percent of 67.8 percent, as originally reported. This article has been updated to reflect the accurate figures.